"NO" - BUT "NO" TO THE END! After five months of endless consultations, continuous retreats and shortly before the conclusion of a new memorandum, the collapse of negotiations led the government and the Syriza leadership to hold a referendum posing the question of whether or not to accept the creditors’ ultimatum. It is obvious that the recourse to this referendum is a confession of failure of the government's tactics, as indeed the Prime Minister himself was forced to admit. The hopes that many people had for an, albeit small, improvement of their position by an anti-memorandum government led by the Left Social Democratic Syriza started to quickly evaporate and finally proved false. Once Syriza took over the reins of power it not only abandoned even the minimum program of Thessaloniki – as well as the restructuring of most part of the debt, the abolition of the Memorandum and the Loan Contract – but requested an extension of the existing Memorandum which they had said they would eliminate in a day and engaged in a lengthy negotiations with the creditors with the aim of signing a new, supposedly milder, memorandum. The moderate electoral Keynesianism of Syriza rapidly turned into a moderate neoliberalism. Between the mammoth debt and the country's participation in the Eurozone, which the government considers as a divine law, there was no room for manoeuvre. But because the international credit institutions and their political staff do not understand the social democratic strategy of gradual changes, nor Mr. Varoufakis’ interpretation of game theory, nor the appeals to democracy and the Europe of peoples, they took advantage of the continuous retreats of the government to trap it and to lead it into deadlock and as a result today they are ready to devour it. Now the government, is reaping the bitter fruits of its failure. It has its back to the wall and is trying to get out of the impasse, that its own strategy led it into, by holding a referendum, from which it looks forward to the victory of NO in order, as it constantly repeats, to the "utilize" it in new negotiations for a better memorandum. Having indeed realized the extent of the impasse they are asking, even at the last moment, for a new loan agreement of € 30 billion! In this way it tries to pass its failure to the voters and to turn their negative response to the proposals of the creditors into a positive vote for itself, to use them as human shield and an ace up their sleeve in the dispute with the creditors in order to sign a new memorandum where the bill will be paid by the people. Of course the government is mistaken if it thinks that the creditors are willing to talk seriously with it and to return to the situation of five months ago. Certainly the victory of YES will immediately lead the government to a humiliating resignation amid a general loss of political confidence. But a NO victory, with any possible "retreat" of creditors, at best, will result again in a new memorandum, worse even than the government's memorandum of 47 pages, which the government will have to implement. This government, like any government in this system, can only be the defender of the interests of the system itself, the administrator of the common affairs of the bourgeoisie. And as an administrator, it should be credible and properly manage these affairs. 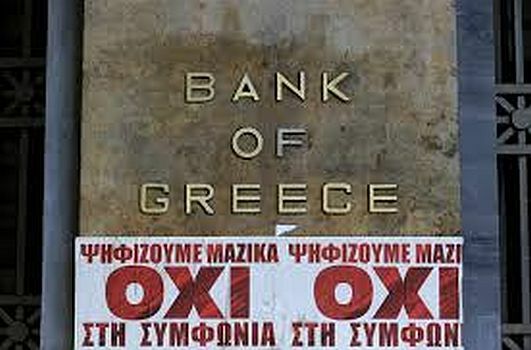 When it cannot manage this, then the establishment turns against the government, which, in this case, is trying desperately to convince them that it is still fighting for their interests, that is to keep the Greeks in the Euro at all costs. The establishment, foreign and local, wants one thing and insistently demands: the, anyway, economic crushing of the lower classes, and first of all the wage labours, in a process of transforming the "debt colony" country into a Chinese-style "free market zone". After the failure of negotiations it is clear that Syriza has lost the trust of the domestic bourgeoisie, once the country's international creditors have made clear their intention that they simply they can’t tolerate it at the helm of the country, because they want governments that are totally submissive to their orders and able to enforce the agreements that they dictate. We have no compassion for what its institutional partners do to Syriza. Everyone chooses his friends. In any case, we didn’t vote for Syriza, with or "without illusions", but instead, insisted firmly on an abstentionist line. We refused to participate in the parliamentary game and we warned about the outcome. We have our own "class family" and we acquit ourselves by defending its interests. The current situation once again finds the world of labor (employed or unemployed) weak. Weak because they have suffered repeated blows during the last five years, they are exhausted after the defeats of their struggles – because the trade union bureaucracies took care to exhausted them in dozens of one day general strikes – and they are disappointed by the new government. And because everything is a matter of the balance of class forces –and the balance is overwhelmingly in favor of capital – they have found themselves in a dead end, idly watching the developments that only work against them. Now we face a referendum against which we are de facto obliged to take a stand. The intentions of the conflicting forces of the system (the government, the creditors, the domestic establishment) are clear. We should express our own intentions and see how in these very difficult and critical circumstances we can we take advantage of the situation in our favor. In this referendum we are not called to give a vote of confidence to the government nor to choose between a 'national' and an 'institutional' memorandum. This referendum is about whether or not we are in favor of the proposals of the creditors. What, then, can we do in this referendum? We must certainly vote against the creditors’ proposals massively and categorically. It is as plain as daylight that a victory of YES is equivalent to the triumph of international bankers and domestic bourgeoisie, who, waving the banner of the "popular verdict", will pounce on it to sweep away everything in their path and place a heavy gravestone on any attempted workers' resistance. Such immediate prospect becomes even more gloomy in a situations of credit squeeze, banking suffocation, threatened bankruptcy, acute political crisis and deep social polarization. This puts the take-over of power by the most reactionary pro-Troika forces in a state of emergency on the agenda and even after three years of consecutive defeats and a pause of the movement, it will be like a cold shower for the people who have been struggling all these years. But the NO of the voters who will reasonably rush to vote against the impending Troika tornado should be a total, categorical and uncompromising NO to the end in against any memorandum agreement with the Troika, against any package of austerity measures, against any new loan agreement with the creditors. This NO should not be remain in the ballot box. Because it is it absolutely certain that if this NO remains in the ballot box it will turn against us. In case of victory, if we leave the No to the government we know perfectly well that we will go to a new memorandum, immediately or shortly after, with the seal or without the seal of the present government. However if we do nothing they will certainly sign one. It is therefore necessary to take the situation into our own hands. This NO should be expressed dynamically from the very next day and make clear its firm opposition to all memorandum concoctions, whatever the Greek government and the Troika call it or sugar it with. We must carry it out in the streets and in workplaces through demonstrations, strikes, occupations, forms of workers’ self-organization, which will raise a barrier to the continuing memorandum hurricane. It should be a springboard for a massive and dynamic workers counterattack against the system that produces crises and loads the devastating consequences on the backs of the vast majority of the people who can live only by their work, workers and the unemployed. It must be a trumpet-call for an internationalist and international class struggle against the pan-European and international capital front and their governments. Our natural allies are of our own, working class family in all countries. It is the workers and the unemployed of Europe, from the countries of the South to the countries of the North. The problem, the explosive consequences of which we experience here, it is the same for all the working classes even if they do not already experience its bitter taste but will sooner or later. The problem is global and can be confronted only on an international scale. Towards the necessary international and internationalist solidarity of the working classes, the capitalist united front tactic is "divide and rule" using the proven weapon of nationalism. We must struggle against nationalism that we face at home. The main enemy is in our own country, in the Greek bourgeois stuff and not in Brussels and Berlin. We have to face up this enemy. The work of the working classes of the other countries is to fight against their own bourgeoisie. In the destruction of our lives we have to oppose not the "national pride" as it "fits the story of the Greeks", as our Prime Minister said, but the fighting pride of a class that produces social wealth and wants to cease to live in servitude, of a class that has to oppose the dignity that fits to its revolutionary history. Only then will we be able, via our struggles, to put sand in the gears of the system, which we cannot destroy at this moment, in order to create the conditions for its overthrow tomorrow. The recipe is summarized in the formula: Proletarian Class Autonomy, or in other words Class Self-organization and Building of the Political Organization of the Working Class. Either Socialism or Barbarism. There is no other way! _On 13 September 2014, on the occasion of the annual international trade exhibition of Thessaloniki, the president of SYRIZA Alexis Tsipras announced measures that SYRIZA would apply from the first days after his inauguration. This is based on four pillars: dealing with the humanitarian crisis, the recovery of the real economy, restoration of employment with the guarantees of an invigorated and strengthened right to work, reform of the powers of the state for citizens. I agreed with much of the statement of the Greek comrades even with their support of the NO vote. It seems to me that the comrades were arguing that for theNO vote to be effective thenit has to be accompanied by a conscious working class resistance not only to the policy of austerity but to Capitalism itself. This places the Comrades in the working class camp as the so called left relies either on parliament or the trade unions to stop austerity which of course is pie in the sky. We entirely agree with your comment "This places the Comrades in the working class camp as the so called left relies either on parliament or the trade unions to stop austerity which of course is pie in the sky." If we did not we would not be continuing an intensive dialogue with them. However the "conversation" goes on. We think that to call for a passive NO vote contradicts the the need for a real autonomous class struggle against austerity and we were clear from the beginning that the referendum was a trap for the Greek working class. They were asked to vote for NO in order to take responsibility for their own austerity programme (NO in fact meant YES but, as it turned out, on even worse conditions). what is also now clear is that the referendum was a product of the split in Syriza with Tsipras and his followers reneging on everything that Syriza stood for whilst the Left Platform wanted to leave the euro. Tsipras has manouevred to get rid of this grouping and it remains to be seen how things will develop from here but we hope to publish a document on the post-election situation by the Greek comrades soon (the problem is that they have to write it in English or French as we have no-one who understands Greek so it slows thing down). It is indeed contradictory to call for voting "no" in a referendum as a springboard for further mobilization. It is an either or situation. Either the class develops its struggle against all factions of the bourgeoisie - there isn't one homogeneous "establishment" - or it allows itself to be trapped in false dichotomies, such as the "Greek people" retain their dignity or they become a debt colony of Germany. This was the ideological play in this referendum, the purpose of which was national containment and detainment of class struggle against austerity. As the previous ICT article on the Greek referendum implied, the kind of argument used by the IC in its support of the No vote verges on opportunism and it should be unambiguously critiqued, as the ICT has already done. Thanks for your comment. The original Notes on the July 5th Referendum were written by our Italian comrades faced with a kind of hysterical enthusiasm for Syriza and its policies even amongst contacts we had in Italy. Of course this kind of attitude that Syriza is the way forward is pretty universal (which is why we got it into English quickly) both amongst the state capitalist left and younger elements who are desperate for a way out. Here in the UK the latest political "cargo cult" surrounds the candidacy of Jeremy Corbyn for Labour leader. All previous attempts at forming a new party to the left of Labour have been abandoned as they all return to the fold (hundreds of thousands of young people do not know the real hsitory of Labour) and the article was very useful in dealing with that discussion - but that is only the beginning. The IC comrades were not so fixed on the referendum but on what would happen after it and this led to them ignore the trap that was being laid. However as the article demonstrates elsewhere and as we know from numerous meetings with the comrades they are not inclined to any kind of opportunism and we will carry on the dialogue to convince a talented nucleus of the Greek proletariat that this was an error rather than cast them to the outer darkness at the first sign of a problem. Thank you for the context Cleishbotham. It might be useful to make a distinction between denunciation (how I understand the phrase casting into the darkness) and critique. The former we reserve for our class enemies; the latter is vital for the eventual emancipation of our class.